Following the money to a great lost Greek city in Afghanistan. Archaeology and astronomy sometimes share a remarkable path of discovery. The erstwhile planet Pluto, for example, was predicted to exist long before it was actually found. The astronomers Percival Lowell and William H. Pickering surmised that an unknown planet must lie somewhere near the edge of our solar system because of its tell-tale effect on the motion of Uranus. They guessed at the dwarf planet’s position, even its mass, but their intensive searches could not produce the object itself. Finally, in 1930 the astronomer Clyde Tombaugh spotted Pluto as a tiny dot on photographs of the constellation Gemini, confirming the scientific expectations of Lowell and Pickering. In similar fashion, it might be said that Ai Khanoum is the Pluto of Old World archaeology. This site on the farthest fringes of Greek civilization was predicted to exist, and was eagerly sought, centuries before its eventual discovery. And, just as with Pluto, experts still remain at odds about what to make of this distant place and its alien environment. Ai Khanoum (meaning ‘Lady Moon’ in Uzbek) lay hidden on the border between Afghanistan and Tajikistan, cradled in the confluence of the Amu (ancient Oxus) and Kokcha Rivers. 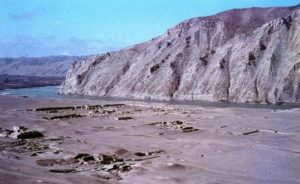 It is one of the fabled “thousand cities of Bactria” that the Greeks claimed to have sprinkled across Central Asia in the aftermath of Alexander the Great’s campaigns. Beginning early in the nineteenth century, European explorers—players in the deadly ‘Great Game’ of international intrigue between Czarist Russia and British India—searched remote Afghan mountains and valleys for just one of these lost Greek cities. They all failed. Some of these adventurous souls were captured, tortured, and beheaded by rivals or resentful locals, others endured disease and starvation—but all went to their graves convinced that somewhere in the wilds of Afghanistan there must be the remains of ancient cities on a par with Athens, Thebes, or Delphi. This dogged belief was not based solely on the unconfirmed statements of ancient authors, nor on the legends current in the region that descendants of Alexander’s soldiers still dwelt there. The real proof rested upon numismatics, a science as fundamental for archaeology as Newtonian physics to astronomy. Figure 1: The largest known ancient silver coin ever minted, depicting a Bactrian king. After many years of fruitless searching, the effort became better organized in 1922 with the foundation of the Délégation Archéologique Française en Afghanistan (DAFA), a French academic mission based in Kabul. Alfred Foucher, the first Director of the DAFA, led a wide-ranging archaeological exploration across Afghanistan keen to locate the missing Greek cities. A lifetime of exasperating labor led nowhere, and poor Foucher finally gave up with the bitter declaration that he had been chasing a mirage. Others continued the work of the DAFA, but as late as 1960 it was lamented that instead of Greek cities, archaeologists had unearthed nothing more than a multitude of coins plus a few pottery scraps unworthy of even a single museum shelf. Then it happened, quite by accident. Muhammad Zahir Shah, the king of Afghanistan, was not hunting a vanished civilization in 1961when he paused to rest on the high ground between the rivers Amu and Kokcha. Yet, there on the very border between his kingdom and the Soviet Union, his eyes swept across a startling scene. As if drawn on paper, the outlines of an entire Greek city bulged before him, its old ramparts, buildings, and streets barely covered by a thin veil of dirt. In the middle of this tableau, a conspicuous Corinthian capital sprouted from the ground like a fossilized flower that had been planted by the ancient Greeks. Local villagers called the place Ai Khanoum (See Figure 2). The Afghan king soon notified the DAFA of his discovery, and teams of eager archaeologists descended on the site. Excavations led by Paul Bernard painstakingly exposed the lost city with trowel and brush, until the Soviet invasion of 1979 drove everyone away—except the looters. Today, even the ruins lie in ruins. Bulldozers have torn into the landscape, churning up anything left behind when the archaeologists fled; metal detectors meant to ferret out old Soviet landmines have instead guided rusty shovels to hidden treasures. Originally hailed as one of the greatest and most anticipated archaeological finds of all time, Ai Khanoum has been stripped of its fullest potential—demoted like luckless Pluto, the planet that no longer is. Despite its sad fate, Ai Khanoum at least enjoyed sixteen seasons of scientific excavation, the results of which are still being published in the series Fouilles d’Ai Khanoum. These volumes offer our best chance to witness what life was like in at least one of the “thousand cities of Bactria.” At this site, a steep natural acropolis stands nearly 200 feet (60 m) high; it slopes down on its northern side to a large rectangular plateau that stretches over a mile (1800 m) along the high banks of the Oxus. An impressive rampart and ditch protected the exposed northeast side of the lower city, and the Kokcha River sealed off the southwest. Ten million bricks extended the rampart all around the triangular site. Inside the walls stood a sprawling palace with adjoining treasure-rooms, an arsenal, a temple, rows of mansions, and the essential amenities of any ancient Greek population: theater, gymnasium, and palaestra. Outside the city were more mansions, another temple, a cemetery, and signs of extensive irrigation that made this desolate landscape bloom. Well-designed for defense and well-positioned to exploit the agricultural and mineral resources of the region, Ai Khanoum guarded a small but powerful Greek colonial presence some 3000 miles east of Athens. Stone inscriptions and papyri found inside the city record traces of the cultural ties maintained between these settlers and their Mediterranean homeland. The famed Delphic Maxims were copied and carried to Ai Khanoum so that, “blazing from afar,” they might keep Hellenism alive in this distant outpost. The palace library held copies of Greek classics, and imported olive oil was stored in the treasury. Yet, as with astronomers and Pluto, archaeologists have begun to second-guess how they ought to label Ai Khanoum. Some important features of the city were decidedly ‘unGreek’, such as temple architecture, and some of the treasury’s staff bore indigenous names such as Oxybazus and Oxyboakes. Was Ai Khanoum really a full-fledged Greek city, or should it be identified as Graeco-Asian or simply Bactrian? Unfortunately, there is no archaeological equivalent of the International Astronomical Union to settle this issue by a vote. What happened to Ai Khanoum remains a mystery. The archaeological evidence indicates a sudden abandonment of the site in about 146 BC. The Greeks left behind a surprising number of valuables in the palace treasury, including semi-precious stones, artwork, and storage jars filled with silver coins. Once the Greek rulers departed, a fire swept through their palace and so-called squatters moved in to scavenge the dead city. The usual assumption is that nomads invaded Bactria and drove the terrified Greeks south across the Hindu Kush Mountains into India. But why the well-armed and securely entrenched Greeks lost their nerve and left so hastily, never to return, is difficult to explain. It is possible, after all, that the nomads only showed up after the Greeks had departed. Perhaps the discovery of more of Bactria’s thousand cities will someday solve this riddle. Meanwhile, we still have all those coins to investigate. They had long intimated that cities existed in Central Asia, but what of the people who lived and labored in those cities? We can be certain they existed, too, but can we hope to discover anything more about them? Fortunately, a new branch of investigation called cognitive numismatics by the author can reveal much about the unseen masses who inhabited Bactria. For example, the anonymous workers who manufactured the coins have left idiosyncratic traces on the money. Sometimes it is possible to reconstruct their thought processes as they went about their tasks in the mint. We can see how they planned a coin’s design, how they went about engraving mirror-image dies, and how they occasionally botched the job due to stress or overwork. One metal die has actually come to light, carved to stamp out large silver coins for King Demetrius (See Figure 4). While exceedingly rare, the dies themselves need not survive to show us the work of the minters, for each die left its tell-tale story on as many as 30,000 coins struck from it. For example, some workers absent-mindedly left out letters or engraved them facing the wrong way; some might catch the error and try to remedy the die by recutting it or by simply sticking the missing letters somewhere else on the die. A simple word such as Basileos (King), which appears on nearly every coin, can at times be mangled by distracted mint workers (See Figure 5). By quantifying these practices, scholars can determine in which periods the minters were most error-prone. Intervals of statistically meaningful mistakes might signal a change in the workforce or a change in working conditions, perhaps in response to larger problems across Bactria. As it happens, serious minting errors characterize the years leading up to the abandonment of Ai Khanoum. This evidence from the ranks of unseen laborers suggests that the people at Ai Khanoum did not awake one morning to discover hordes of nomads suddenly bearing down upon them, but rather had been coping with some crisis for a long while prior to leaving. Scholars must therefore reconsider the once-popular notion that everything at Ai Khanoum was fine right up to its last day. Using coins to eavesdrop on the workplace adds a deeper dimension to the archaeological search for this lost civilization. By following the money, we have found numerous Greek kings, one notable royal city, and generations of anonymous workers toiling in the mints with a lot on their minds. At sites such as ‘Lady Moon’, the rewards of archaeology can be truly astronomical. 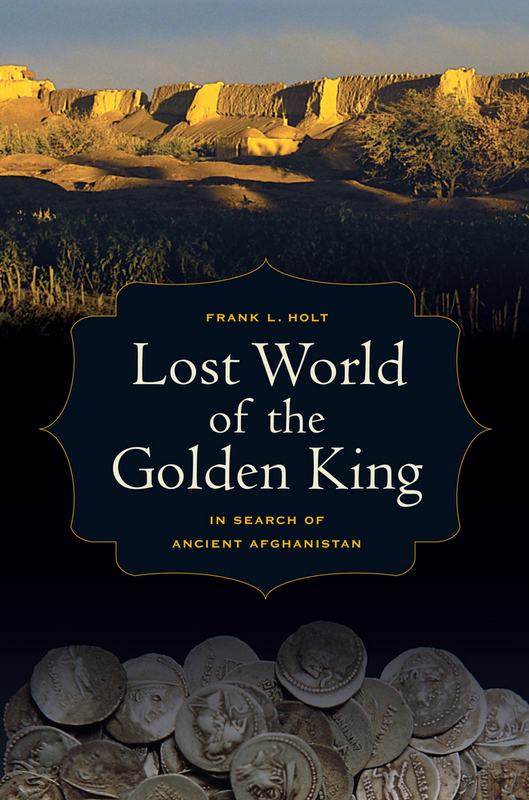 Much more about the search for ancient Greek Bactria can be found in Frank Holt’s recent book, Lost World of the Golden King: In Search of Ancient Afghanistan, which can be purchased at the University of California Press website. 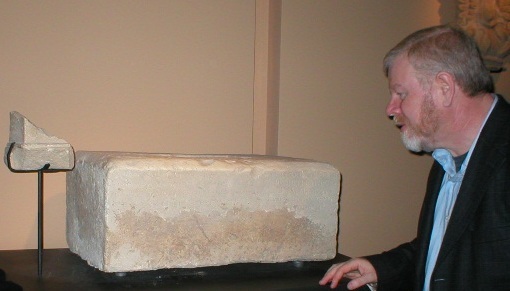 Professor Frank Holt (MA and PhD, University of Virginia) teaches at the University of Houston and specializes in ancient Greek history. He has published seven books on Alexander the Great and his legacy. He has also published more than 50 articles and essays. He has been awarded several research prizes in the US and abroad, a national writing prize, and seven major teaching honors, including the inaugural Distinguished Leadership in Teaching Excellence Award (2011). He is currently working on several books, including a study of Alexander’s wealth to be published by Oxford University Press in conjunction with his appointment as an Onassis Senior Visiting Scholar.